97. 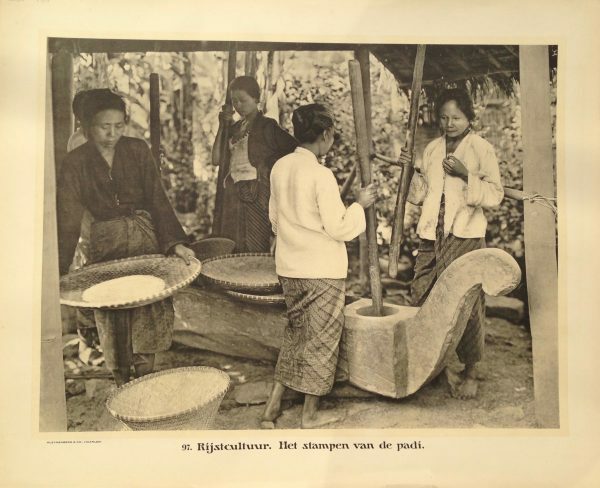 Rijstcultuur. Het stampen van de padi. Antique school board of Rijstcultuur. Het stampen van de padi .c.1895 and published between 1912 and 1914 in Holland. The Regent of Blitar in East Java posed for this unusual portrait flanked by chiefs from his own districts and elsewhere. Descended from a long line of rulers who frequently married into nobility outside the region, the nobles lived an existence that was totally alien to the common man. In this plate, each chief is depicted with a bearer holding a closed parasol. The width of the stripes, the colors and size of each parasol signify the rank of the noble. Gold and certain patterns were reserved exclusively for the monarch and his immediate blood relations. The cone-shaped hat, the embroidery on the costume, the manner in which the sarong is folded. even the shoes the ruler is wearing were indicative of his rank.